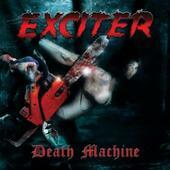 Unsung pioneers of the thrash metal movement, Canada’s Exciter return with "Death Machine," their second offering since their current reformation. Delivering a no-frills nine-track thrash metal tour de force, this quartet’s relentless nature is embedded in the scalding fretwork (“Skull Breaker”) while rabid aggression oozes from every blistering percussive run (“Razor in Your Back”) and histrionic Udo-meets-Bobby Blitz vocal scream (“Demented Prisoner”), exuding the raw feel and devil may care attitude of the days when this band ran along side the likes of Raven, Anvil, and Venom. Commandeering a virtuous blend of speed-infused heavy music with a vintage pedal to the metal attitude fully intact, Exciter grant metal fans an authentic trip back into time with their latest offering from these seasoned veterans. For more information, check out http://www.excitermetal.com.